The 69th mathadhipati (head of the mutt) of the revered Kanchi Kamakoti Peetham, Sri Jayendra Saraswathi who attained samadhi on Wednesday, 28 February, was interred in the Brindavanam inside the mutt premises. Sri Jayendra Saraswathi was not only very different in personality from his immediate predecessor Sri Chandrashekarendra Saraswathi but also from most acharyas of the Kanchi lineage. He broke barriers, pushed the envelope, tested the limits of orthodoxy that his predecessor insisted upon and guarded all his life, and took risks while charting the mutt through previously uncharted territories in his quest to expand the footprint of the Kanchi mutt. His belief in and single-minded pursuit of “manavaseva is Maheshwaraseva” (serving the man is serving God) transformed what was a mutt that was purely focussed on the spiritual into a socially and culturally vibrant organisation that today runs several hospitals, schools, Veda pathashalas, a deemed university, senior-citizen homes and several temples. Here we look at some of the key events that shaped the life and legacy of one of the great gurus of our times. MR Seshadri, assistant professor at the Meenakshi Sundararajan Engineering College, Chennai, remembers the Monday of 22 March 1954 when the boy Subramanian received his sannyasa deeksha and mahopadesha at the Mukthi Mandapam on the banks of the Sarvateerthakulam (tank) in Kanchipuram. To the 10-year old Seshadri who was at the Sri Matham that day, with his mother Rajammal (who was a close friend of Subramanian’s mother), the boy Subramanian came across as a jovial, happy-go-lucky young man with a large grin and an innocent face. He says, he wondered then if the young man knew what he was getting into. 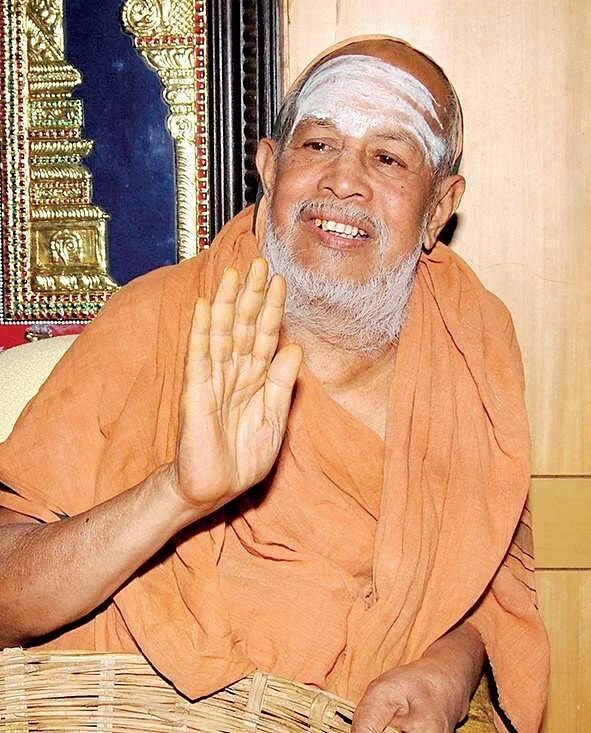 From that day on, 19-year-old Subramanian became the 69th head of the Sri Kanchi Kamakoti Peetham and was given the sannyasa name of Sri Paramahamsa Parivrajakacharyavarya Sri Jayendra Saraswathi Swamigal. It would set him on a tumultuous journey where he would experience great highs, desperate lows, unimagined fame, respect, and glory while also being subjected to needless calumny and slander all ending though in glorious vindication and final sublimation in the divine. Subramanian Mahadeva was born on 18 July 1935 in the small village of Irulneeki in Mannargudi, Thiruvarur district of Tamil Nadu, to Mahadeva Iyer and Saraswathi. Initiated into the learning of the Rg Veda at the age of 5, Subramanian continued his further Vedic studies and the dharma shastras at Thiruvidaimarudur under the tutelage of BrahmaSri Krishnamurthy Sastrigal. This move to Thiruvidaimarudur came about through the grace and direct intervention of the 68th Mathadhipathi, Paramacharya Sri Chandrashekarendra Saraswathi who knew the family; this was an early indication that the senior pontiff was taking a keen interest in the boy Subramanian. Soon enough in the year 1948, the Paramacharya sent a word through the mutt managers to the family that he considered Subramanian as the most suitable to succeed him as the 69th pontiff of the revered Kamakotipeetham. Six years later would come the initiation into sannyasa followed by a 17-year period of study, training, meditation, and contemplation under the direct guidance of Sri Chandrashekarendra Saraswathi. Devotees started referring to the senior pontiff as “Maha-Periyava” and the younger Jayendra Sarswathi as “Pudhu-Periyava”. The story goes that, in addition to all the other qualities that the MahaPeriayava saw in the boy Subramanian, one characteristic that he noted was that the boy’s horoscope showed a strong dhana-akarshana (attraction to wealth) in addition to jana-akarshana (attraction to people) and jala-akarshana (attraction to water). That was the time when the mutt found it difficult to get sufficient funds even for the daily puja. The MahaPeriayava’s intuitive decision to choose the boy Subramanian would turn out to be a masterstroke as the latter turned out to be truly an irulneeki (dispeller of darkness) for the mutt in particular and dharma in general. He would also set the mutt on a completely new and hitherto uncharted path that would make it one of the highest profile Sankara mutts of the country. On 9 September 1987, several lakh devotees lined the streets of Kanchi and thronged the mutt to welcome back their dear Swami who had deserted them 17 days earlier. Many had tears in their eyes and the atmosphere was charged with the chants of “Jaya Jaya Sankara, Hara Hara Sankara” as the crowd of devotees sighed in relief and others openly wept on once again seeing the smiling and familiar visage of Sri Jayendra Saraswathi. Even the heavens opened up that day and the uncharacteristically heavy downpour flooded the narrow streets of Kanchipuram, but this did not dampen the spirit of the devotees. Apparently, Sri Jayendra’s socio-cultural outreach programs and attempts to take the mutt to hitherto uncharted territories and political activism when he took on the divisive Tamil-centric Dravidian agenda of M Karunannidhi stating that Sanskrit was his father and Tamil his mother did not go down well with many people including those in the mutt. This activism and socio-cultural outreach did not go down well with old mutt hands and this was perhaps the reason for his sudden and unannounced disappearance from the mutt. He said later that he returned because of his love and attachment to the Paramacharya and to assuage the anxiety of his devotees. Soon after his return, he was closeted with the MahaPeriyava for over two hours. He announced later that he had obtained permission to plunge into the hustle and bustle of society and make a difference. Sri Jayendra Saraswathi believed that the only way to revive and re-invigorate the dharma would be to take it to the doorsteps of every home. Jana-Kalyana and Jana-Jagarana were born out of this desire to flatten the opportunities and reach the poorest of the poor irrespective of caste or socio-cultural status. The credit of bringing this missionary zeal to propagate the Dharma goes entirely to him. For example, during the Bhuj earthquake he traveled over 800 Kms meeting with victims, providing solace and courage and organizing reconstruction of destroyed houses. His decision to issue certificates to trained priests belonging to any or all communities of Sri Tantra Vidyapeetham, Kerala was not only brave but path-breaking. To him should go the credit of being the first to break the caste barrier in the appointment of priest to temples. The Veda Rakshana Nidhi Trust that runs and aids several Veda pathashalas, conducting examinations, awarding certificates, the Veda Sastra Pandita Raksha Sabha, the Veda Patha Nidhi Trust, the Dharma ParipalanaSabhas were all set up with the sole aim of promoting and preserving the rich cultural heritage of Bharat. The Sri Chandrashekarendra Saraswathi Viswa Mahavidyalaya a deemed university, the special girls hostel in Kanchipuram, the many Sankara schools across southern India, the Sri Jayendra Saraswathi Ayurveda College and Hospital, the Kanchi Kamakoti CHILDS Trust Hospital, the SIES Senior’s Home in Nerul, Navi Mumbai and the world famous Sankara Nethralaya Group of Hospitals are all testimony to the vision and determination of Sri Jayendra Saraswathi. Sri Jayendra Saraswathi was firm in his view that it was more important to revive and rebuild old temples than establish new ones. He is credited with having conducted no less than a thousand Kumbabhishekams all over India including the North East.The temple in Gangtok, Sikkim for the Jawans at the border and the initiation of the Sindhu Pujan in Ladakh are examples of the extent of his outreach. A vicious campaign mounted by elements from within the political, intellectual, media establishments, and a few disgruntled elements from within the mutt led to a campaign of slander and vendetta that further led to the foisting of a false murder case against him and his arrest. He was denied bail and made to languish in jail for two months before coming out on bail. “…the amount of disrepute and sacrilege inflicted upon Sri Jayendra Saraswathi, as of now, is so enormous that it has hardly any comparables” “harshest possible words were used directly or in innuendo against him”. It is interesting to note here that during my conversation with MR Seshadri, he also mentioned that the MahaPeriyava had not only noted the strong “dhana-akarshana” but also had seen that Sri Jayendra Saraswathi would suffer a brief period of kara-graha-vaasam (jail term). We, of course, have no corroborative evidence to confirm this, but one can speculate that perhaps he had confided in Sri Jayendra Saraswathi and it was perhaps this that explains the equanimity and stoicism that he displayed before, during, and after this bitter period of his life. Sri Jayendra Saraswathi will be remembered as the first of the modern Sankaracharyas who dared to break tradition and as someone who took the teachings of Adi Sankara to people beyond the Brahmin community. That he was much loved by people of all communities and castes was evident from the number of people who turned up to pay their last respects including many Muslims of Kanchipuram. He converted an inward-looking spiritual mutt into a vibrant, socio-culturally relevant and philanthropically active organization in the key areas of health, education, revival of dharma and social reform. His successor Sri ViJayendra Saraswathi has his work cut out but his job has been made easier by his predecessor who chose to tread the path less travelled.